Digital signs are located across campus to provide information about campus activities. They are also a part of FMU’s emergency alert system. 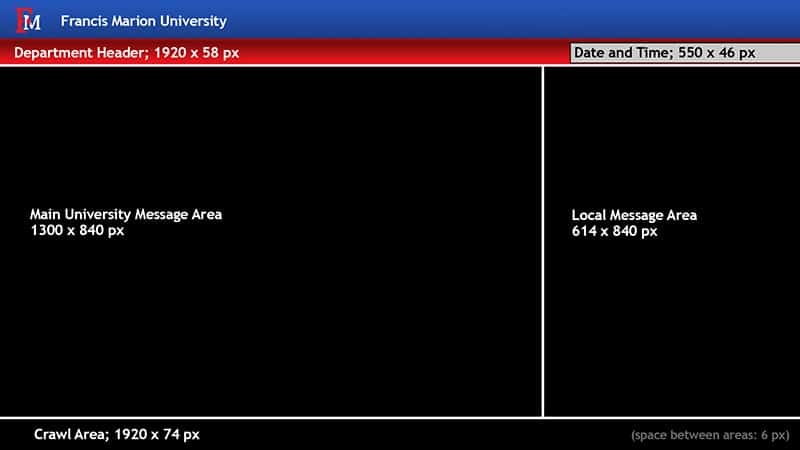 University Communications oversees the content of the main messaging area, layout, and guidelines of the signage. Individual departments are responsible for the local area of the digital signage. The local area should adhere to the guidelines and principles of good design. The university uses the Rise Vision Digital Signage system. Access as a user will be granted by University Communications. A Google Chrome Box, on a wireless internet connection, connects to the Rise Vision platform through their player. The general layout for the digital signs is shown below. Digital signs hang in landscape orientation, sectioned off into different screen areas. A majority of these areas are reserved for use by University Communications. The main header shows the FM logo and the words “Francis Marion University” on the left. The right side may be used for additional text. The department header states where the digital sign is located and/or which department is responsible for the “local message area”. The Main Area shows content that is of interest campus-wide. (Sometimes an exception may occur.) Any content in this area needs to be submitted through University Communications. The local message area is the space departments may use for content relevant to their constituents. Content may be text, photos, or graphics. Please remember to stay within the graphics guidelines and respect copyright laws regarding images and graphics. The bottom crawl area may be tailored to the department’s wishes to display an RSS feed or custom text crawl. Suitable events include all those that are either sponsored or co-sponsored by a FMU department, center or office. Student organizations requesting signage must be a registered student organization in good standing and/or faculty sponsored. Be of interest to and open to the entire university community. Be of interest to and open to the public. In most cases, student-oriented events are acceptable. University Communications will be the final arbiter as appropriateness of content submitted. Send all slide submissions or display information to University Communications by using the Digital Sign Request Form. Submissions must be made at least one week in advance of the event date. Failure to give proper time to post the slide may result in the slide not being displayed. Exceptions may be made dependent on departmental needs. Upon submission, you will be required to give a start and end date for the display. Please proofread slides before submitting. Preferred artwork should be sent via email to PublicAffairs@fmarion.edu. A photo or high resolution graphic is requested, but not required. University Communications can provide a photo/graphic, or the requestor should email the photo, or it can be placed in the template and then emailed. Photos should be sent to PublicAffairs@fmarion.edu. Slides will not be posted without being given a specific start date and end date. Francis Marion University reserves the right to refuse to publish any content deemed inappropriate (based on content, language, pictures, images, etc.) by the managers of the digital signage system. Images need to be 300 dpi. Note: the actual size of the image you use is important. A small image at 72 dpi will become pixilated when enlarged. Instead, begin with a large image and scale down as necessary. Files containing pixilated images will be returned.